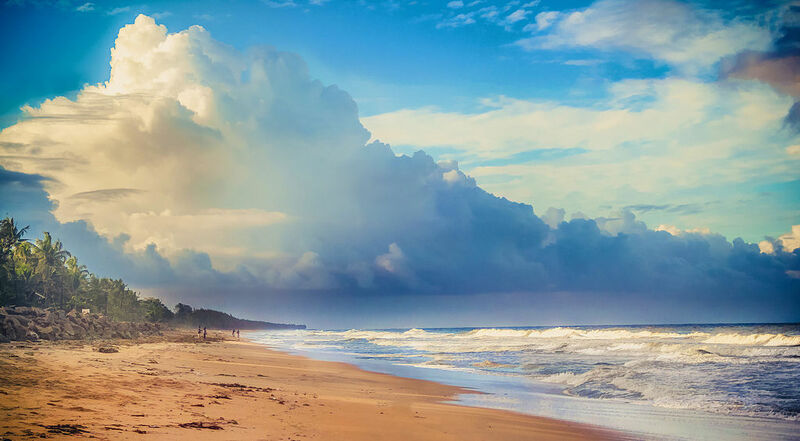 When you dream about Indian beaches, only one place comes to mind. Goa. Endless sand and the Arabian Sea. Small fishing villages and swaying palm trees. Full-moon parties and low-key hotels. Forts and temples in the background. It’s one of those places to which you can return again and again. But that means you aren’t giving yourself a chance to fall in love with other beaches along the coast. So this time, you’re heading farther south. The state is Kerala. It sits on the Malabar Coast and runs to the southwestern tip of India. The city is Kochi. The charming city has been India’s first port of call for Arab, Chinese, and European traders for centuries. The island is Vypin. It’s known as the Princess of the Arabian Sea. Vypin is 17 miles long. Lagoons and canals face Kochi. Goshree Bridges connect the island to the mainland. A fishing harbor, Munambam, sits on the northern tip. The island’s eclectic architecture—a Portuguese fort, Catholic churches, Hindu temples, a Muslim mosque, a Jewish synagogue, and British Raj houses—hint at the trading port’s long history. While golden-sand beaches face the sea. You’re heading to Cherai in the center of the island. It’s a resort town that’s seeped in history. Pallipuram Fort is the oldest European monument in India. Cheraman Juma Mosque and Kottakkavu Mar Thoma Syro were the first mosque and church, respectively, to be built in the country. Plus there are numerous temples and shrines. But, at least initially, your focus is Cherai Beach. It’s six miles long, covered with big grains of sand, and bordered by (usually) calm water. It’s gorgeous. Just steps from the beach, you’ll find a little hotel amidst green lawns, coconut groves, and tropical plants. Club Mahindra Cherai Beach fits your dream of an Indian beach hotel to a tee. Small cottages with wooden roofs are scattered among the property. Ayurvedic treatments tempt you into the spa. The smell of cooking crabs and mussels, squid and prawns swirls from its restaurant, Aromi Di Italia. While bikes, kayaks, and paddle boats are ready for you to start exploring. Goa finally has some competition.